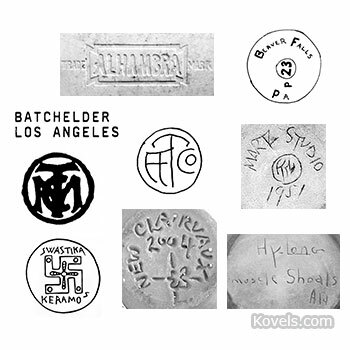 Fat Lava is a nickname given to pottery made in West Germany (1949-1990) during the 1960s and ’70s. 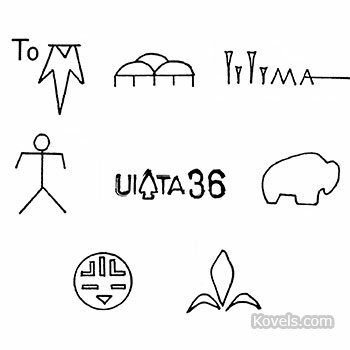 We chose Fat Lava vases, each by a different maker, and their accompanying marks. 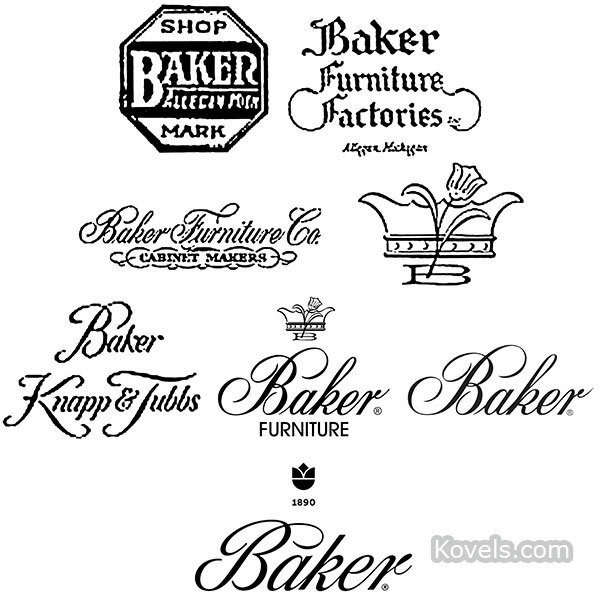 Through most of its history, Baker Furniture has been known for quality reproductions of classic furniture. 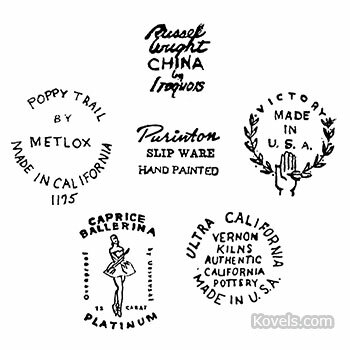 Here are some of the marks used by the company over the years. 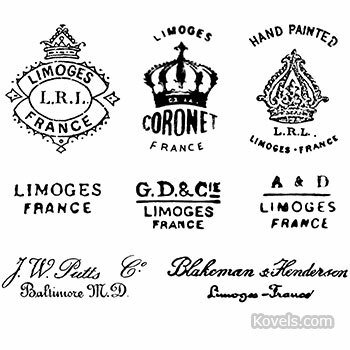 In the 1920s in France, there were more than 48 factories and over 400 known factory marks identifying pieces of Limoges porcelain. Marks signify a decorator, importer or retailer. Other initials or words in the mark can be artist or pattern names. The word "ceramics" refers to items made from clay and fired in a kiln. In most American pottery, look at the bottom first for information. You may be the owner of a valuable piece of porcelain or pottery, and the cryptic symbol on the underside of the piece may be your only clue to its value. The American Brilliant Period for cut glass spanned about 40 years to the end of World War I. 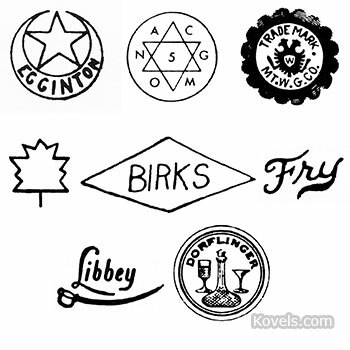 Here are some marks used by companies that made cut glass during the American Brilliant Period. Mickey Mouse was introduced in a cartoon in 1928. The first endorsed merchandise was a 1929 school tablet. 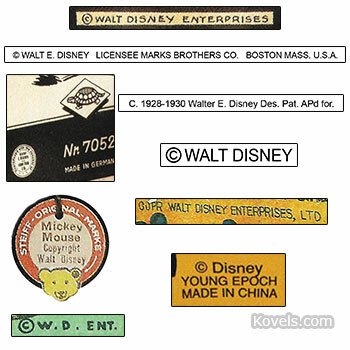 Disney toys have been made in recent years and the registered marks tell they are reproductions. These marks are taken from actual toys. Authentic American Indian hand-made silver jewelry sells for high prices, but buyers should beware because some of the jewelry sold as “Indian” is mass-produced imitation jewelry. 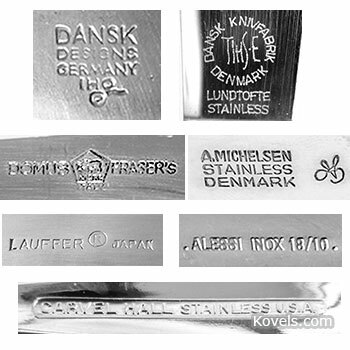 Modern stainless steel flatware looks good on the table and is very salable. These wonderful designs are mostly from the 1950s and 1960s. We get lots of mail asking about American dinnerware - how to identify the maker, pattern, age, and value. The mark on the bottom of the dishes helps provide the answers. 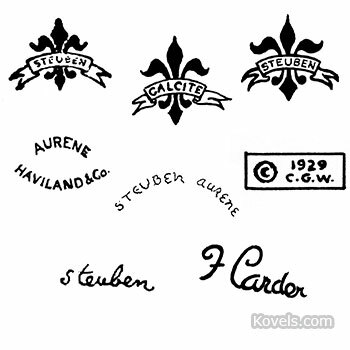 Steuben Glass Works was founded in Corning, New York, in 1903 by Frederick Carder (1863-1963) and T.G. Hawkes Sr.